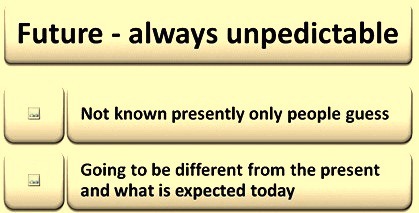 Future is always unpredictable (Fig 1), though it is an important aspect for planning for an organization. Future can be described only by two things namely (i) it is not known in the present and only people can make a guess about it, and (ii) it is going to be different than what exists today and from what is expected now. The above statements are not principally new or particularly unusual. But these statements have far-reaching following implications. If present day actions and commitments are based on the predictions of future events then these are wasted attempts. The best thing which the people can hope to do is to anticipate the future effects of the events which have already permanently taken place. But it does not precisely mean that because the future is going to be different and cannot be predicted, people continue to function in the present way with the comfortable assumption that nothing is going to change. Though it is risky to make the unexpected and unpredicted future, still it is a normal activity. And it is less risky than sailing along on the comfortable assumption that nothing is going to change and also less risky than following a possibility of ‘what must happen’ or ‘what is most probable’. Management is required to accept the need to work systematically on making of the organizational future. But this does not mean that the management can work for the elimination of risks and uncertainties since this is not feasible. The one thing the management can try to do is to find, and occasionally to create, the right risk and to exploit uncertainty. The purpose of the work on making the future is not to decide what is required to be done in future, but what is to be done now to have a future. People are slowly learning how to do this work systematically and with direction and control. The starting point is the realization that there are two different, though complementary, approaches as given below. Finding and utilizing the time gap between the appearance of a discontinuity in economy and society and its full impact. This is often called as the anticipation of a future which has already happened. Imposing on the, as yet, unborn future a new idea which tries to give direction and shape to what is to come. This is often called as ‘making the future happens’. There is a normally a time gap between a major social, economic, or cultural occurrence and its full impact. As an example, a sharp fall or a sharp increase in the birthrate does not have an impact the magnitude of the availability of the work force for coming fifteen to twenty years. But the change has already happened. Only catastrophe such as destructive war, famine, or epidemic can change its impact in the future. These are the prospects of the future which has already happened. These can hence be called a potential. But the future which has already happened is not within the present-day organization, it has happened outside which is a change in society, knowledge, culture, industry, or economic structure. The change which has happened is, moreover, a major change rather than a trend, a break in the pattern rather than a variation within it. There is, of course, considerable uncertainty and risk in committing resources to anticipation. But the risk is limited. People cannot really know how quickly the impact is going to occur. But that it is going to occur which the people can say with a high degree of confidence and to a useful extent people can describe it. Fundamental knowledge has to be available today for people to be able to know what the likely scenario is fifteen to twenty years hence. For example, in the early nineteenth century people could only speculate about the consequences for the economy of the invention of steam locomotives. A good many of the speculations were undoubtedly wide off the mark. But that this breakthrough into the field of transportation would have major impact could be said with some certainty. Major cultural changes, too, operate over a fairly long period. This is particularly true of the delicate but most inescapable cultural change, which is a change in people’s awareness. For example, it is certain that present underdeveloped countries are going to be successful in rapidly developing themselves. On the contrary, it is probable that only a few are going to be successful, and that even these few are going to have difficult times and suffer severe crises. But that the people of these countries have become aware of the possibility of development and that they have committed themselves to it and to its consequences is a fact. It creates a momentum that only a calamity can reverse. These countries may not succeed in creating industries themselves. But they are g to give priority to the industrial development. These countries may face hard times which only emphasize their new awareness of the possibility of, and need for, industrial development. The changes which generate the future that has already happened can be found through ‘systematic search’. The first area to examine is always ‘demographics’. Population changes are always very vital especially for the work force, for the market, for social pressures, and economic prospects. They are the least reversible in the normal course of events. They have a known minimum lead-time between the change and impact. As an example, it is known that the increase in the birthrate is going to put pressure on school facilities and at least a few years are going to elapse before this pressure to come. Thus, the significances of population changes are generally closely predictable. Another area which always needs to be searched for a future that has already happened is the area of ‘knowledge’. However, this search need not be confined to the present knowledge areas of the organization. In looking for the future, let it be assumed that, say, the organization is going to be different. And one of the major areas in which management may be able to anticipate a different organization is that of the knowledge resource on which the specific excellence of the organization is founded. Hence, the management is to look at major knowledge areas, whether they have a direct relation to the present organization or not. And wherever the management finds a fundamental change which has not yet had major impact, it is to ask whether there opportunities available here which people are to and can anticipate. The behavioural sciences provide an example of a major change in a knowledge area, although few organizations consider that it has a direct relevance to them. Learning theory is one area in psychology where really new knowledge has been developed. Although this may seem rather remote to the organizational management, the new knowledge is likely to have wide spread impacts which even include research organization and research management. Organizational management also looks at other industries, other countries, and other markets with the objective to know whether anything has happened there which may establish a pattern for the industry, the country, or the market. Next, organizational management always ask whether anything is happening in the structure of the industry which points towards a major change. Example of one such change is the materials revolution, which erases or blurs the lines which traditionally separated different materials streams. Several years ago, most of the finished products were coming out of the material streams which had specific and unique end-uses. In other words, most of the products determined end-uses, and most end-uses determined the products. However, these days even the processes are no longer unique. As an example, the paper industry increasingly incorporates into their processes techniques developed by the plastics manufacturers and converters; and the textile industry increasingly adapts paper industry processes. Inside the organization, also, there can usually be found clues to events which, while basic and irreversible, have not yet had their full impact. Frequently one indication is internal friction within the organization. Something when it is introduced can become a source of dissension. Unintentionally, management may touch a sensitive issue. The issue is sensitive often because the new activity is in anticipation of future changes and, hence, in contradiction to the accepted pattern. As an example, in an organization, when product development is introduced as a new function and as a specific kind of work, it creates friction. Usually this establishes itself in a long dispute as to where the new activity belongs. Whether it belong to marketing, or whether it belongs in research and development. Actually, this is much less a dispute over the new function than it is a vague first awareness that the marketing approach tends to make all functions secondary and that all functions are cost centres rather than producers of results. This, however, must lead to fundamental changes in organization. It is the anticipation of these changes that makes people reacts violently to the symptom, ‘product development’. Two additional and related issues which the management is required to be aware of are (i) what is likely to happen ten, fifteen, or twenty years which the approved forecasts normally assert, and (ii) whether it has actually already happened. A large number of people can imagine only what they have already seen. Hence, if a forecast meets with widespread acceptance, it is quite likely that it does not forecast the future, but in effect, reports on the recent past. There is a well-known example about the usefulness of this approach in American industrial history. In the beginning of the twentieth century, in the early years of Henry Ford’s success, the first forecasts appeared which predicted that the automobiles are going to become a means for the mass transportation. A large number of people at that time still considered this unlikely to happen before another 30 years to 35 years. But William C. Durant, then a small manufacturer, thought whether this had not which has already happened. His thinking made him see the obvious that it had already happened, though the main impact was yet to come. The public’s awareness had changed from regarding the car as an item of the rich to demanding a car for mass transportation. And there was a need for large automobile organizations. On this insight, Durant conceived General Motors and began to pull together a number of small automobile manufacturers and small accessory producing organizations into the kind of organization which was going to be able to take advantage of this new market and its opportunity. Hence, the final issue is what the own assumptions regarding society and the economy, the market and customer, knowledge and technology of the people are and whether they are still valid. Looking for the future which has already happened and anticipating its impacts introduces a new insight in the management holding the view. The new event is easily visible, as the above example has made clear. The need is to make the management to see it. What can or may then be done is usually not too difficult to discover. The opportunities, in other words, are neither far-off nor vague. The pattern, however, has to be recognized first. As the above example has also shown, this is an approach of great power. But there is also a major hazard. The temptation is to see as a change which is believed to be happening or worse, which is believed to happen. This is so big a hazard that, as a general rule, any finding is to be distrusted for which there is interest within the organization. If most of the people say that this is what they wanted all along, then it is likely that wishes rather than facts are being reported. For the power of this approach is that it questions and finally overturns deeply rooted assumptions, practices, and habits. It leads to decisions to work toward change in the entire conduct, if not in the structure, of the organization. It leads to the decision to make the future different. It is pointless to try to guess what products and processes the future needs. But at the same time, it is possible to decide what idea management wants to make a reality in the future, and to build a different organization on such an idea. ‘Making the future happen’ also means creating a different organization. But what makes the future happen is always the embodiment of the organization of an idea of a different economy, a different technology, a different society. It need not be a big idea, but it is to be one which differs from the norm of today. The idea has to be an entrepreneurial one which is to be an idea of wealth-producing potential and capacity, expressed in a going, working, producing organization, and effective through organizational actions and behaviour. It does not emerge from the issue what future of the society is to be since such issue concerns a social reformer, revolutionary, or philosopher. Underlying the entrepreneurial idea which makes the future of the organization is always the issue, which concerns the major change in the economy, the market, or knowledge since it enables the management to run the organization the way it is required to be run, the way the organization really achieves the best economic results. Each of the organizational idea is rather narrow, though a large proportion of organizational ideas are effective. Hence, the innovating management has a good deal more impact. The very fact that an entrepreneurial idea does not encompass the entire society or all of knowledge but encompasses just one narrow area makes it more viable. The management which has this idea may be wrong about everything else in the future economy or society. But that does not matter as long as it is almost right with respect to the organizational focus. All that it needs to be successful is one small, specific development. As an example, the founder and builder of IBM did not see, at all, the development of technology. But he had the idea of data processing as a unifying concept on which to build an organization. The organization was, for a long time, fairly small and confined itself to such ordinary work as keeping accounting registers and time records. But it was ready to jump when the technology came in which made data processing actually possible, the technology of the electronic computer. While IBM founder built a small and unspectacular organization in the 1920s designing, selling, and installing punch-card equipment, the mathematicians and logicians of logical positivism talked about and wrote a systematic methodology of quantification and universal measurements. It was most unlikely that they ever heard of the young, struggling organization named IBM, and certain that they did not connect their ideas with it. Yet it was IBM and not their philosophical ideas became operational when the new technology emerged. There is another example of retail organizations. People who built such organizations in the beginning might have active social concerns and a lively social imagination. Yet none of them thought of remaking the economy. It is even doubtful that the idea of a mass market, as opposed to the traditional class markets, occurred to them until long after the event. Yet, from its early beginnings, these people had the idea that the poor man’s money could be made to have the same purchasing power as the rich man’s. This was not a particularly new idea. Social reformers and economists had discussed it for decades. The cooperative movement mainly grew out of it. But those people who first built an organization on this idea started out with the query, ‘what can make the farmer a customer for a retail organization’. The answer was simple that he needs to be sure of getting goods of the same dependable quality as do the city people at the same low price. At the time, this was an innovative idea of considerable courage. Great entrepreneurial innovations have been achieved by converting an existing theoretical proposition into an effective organization. The entrepreneurial innovation which has had a great impact on economic development converted the theoretical proposition of the French social philosopher into a bank. The philosopher, starting from an earlier concept of the entrepreneur, developed a philosophical system around the creative role of capital. The idea became effective, however, through a banking organization. The entrepreneur who first founded a banking organization was to be the conscious developer of industry through the direction of the liquid resources of the community. It became then prototype for the entire banking system. The banking organizations then became the main agents for the industrial development. The basic entrepreneurial idea may merely be imitation of something which works well in another country or in another industry. For example, Thomas Bata, a Slovak shoemaker, had the idea from USA and noticed that everybody in Slovakia and the Balkans could have shoes to wear. The ‘farmer goes barefoot’; he is reported to have said, ‘not because he is too poor, but because there are no shoes’. What was needed to make this vision of farmers wearing shoes come true was a supply of cheap and standardized, but well-designed and durable, footwear. On this analogy Bata built in a few years Europe’s largest shoe business and one of Europe’s most successful companies. For making the future happen people need not have a creative imagination. It needs work rather than genius and hence is accessible in some amount to everyone. The people of creative imagination have more imaginative ideas, to be sure. But whether the more imaginative idea is actually be more successful is by no means certain. Ordinary ideas have at times been successful; Bata’s idea of making shoes was not very original in the Europe of 1920, but it needed his courage rather than his genius. For making the future happen management has to be willing to do something new. It has to be willing to ask, what the people want to see happen which is quite different from today. Management has to be willing to say that this is the right thing to happen as the future of the organization and people are going to work on making it happen. Lack of creativity is not the real problem. There are more ideas in any organization than can possibly be put to use. What is lacking, as a rule, is the willingness to look beyond products to ideas. Products and processes are only the vehicle through which an idea becomes effective. And, it is very often that the specific future products and processes can usually not even be imagined. As an example, when DuPont started the work on the chemistry of the polymers out of which nylon eventually evolved, it did not know that manmade fibres can be the end product. DuPont acted on the assumption that any gain in the ability of man to manipulate the structure of large, organic molecules which was at that time in its early stages, can lead to commercially important results of some kind. Only after a number of years of research work did manmade fibres first appear as a possible major result area. Also, organizational management often lacks the courage to commit resources to such an idea. The resources which need to be invested in making the future happen are usually small, but they are to be the best. Otherwise nothing happens. Still, the greatest lack of the management is a benchmark of validity and practicality. An idea has to meet rigorous tests if it is to be capable of making the future of the organization. It has to have operational validity. Whether management can take action on this idea, or whether it can only talk about it, or whether it can really do something right away to bring about the kind of future it want to make happen, does not depends upon on its ability to spend money on research but on the research directed toward the realization of the idea. The knowledge sought can be general, as was that of DuPont’s project. But it must at least be reasonably clear that if available, it is to be applicable knowledge. The idea is also to have economic validity. If it can be put to work right away in practice, it is to be able to produce economic results. Management may not be able to do what it likes may be for a long time, perhaps never, but if it can do it now, the resulting products, processes, or services are to find a customer, a market, an end use. It is to be capable of being sold profitably, is to satisfy a want and a need. The idea itself may aim at social reform. But unless the organization can be built on it, it is not a valid entrepreneurial idea. The test of the idea is not the votes it gets or the acclaim of the philosophers. It is economic performance and economic results. Even if the underlying principle of the organization is social reform rather than organizational success, the criterion is to be the ability to perform and to survive as an organization. Finally, the idea is to meet the test of personal commitment. Whether the management really believes in the idea and whether it really wants to be those kinds of people who do that kind of work and run that kind of organization. To make the future requires courage. It requires work. But it also requires faith. Management to commit to the expedient is simply not practical. It does not suffice for the tests ahead. As it is known that no such idea is fool proof neither it is to be. The one idea regarding the future which must inevitably fail is the apparently ‘sure thing’, and the ‘riskless idea’ is the one which cannot fail. The idea on which organization of future is to be built must be uncertain as no one can really say as yet what it is going to look like if and when it becomes reality. It is going to be risky. It has a probability of success but also of failure. If it is not both uncertain and risky, it is simply not a practical idea for the future, for the future itself which is both uncertain and risky. Unless there is personal commitment to the values of the idea and faith in the management, the necessary efforts therefore cannot be sustained. The management is not to become enthusiast, let alone a fanatic. It is to be understood that things do not happen just because management wants them to happen, not even if it works very hard at making them happen. Like any other effort, the work on making the future happen is to be reviewed periodically to see whether continuation can still be justified both by the results of the work to date and by the prospects ahead. Ideas regarding the future can become investments in managerial ego too, and need to be carefully tested for their capacity to perform and to give results. But the management who works on making the future also need to be able to say with conviction that this is what it really wants the organization to be. It is perhaps not absolutely necessary for every organization to search for the idea which makes the future. A good many organizations and their managements do not even make their present organizations effective and yet the organizations somehow survive for a while. The big organizations, in particular, seem to be able to sail a long time on the courage, work, and vision of earlier managements. But future always arrives. It is always different. And then even the strongest organization is in trouble if it has not worked on the future. It is going to lose distinction and leadership and all which remains is big organizational overhead. It neither controls nor understands what is happening. Not having ventured to take the risk of making the new happen, it perforce has taken the much greater risk of being surprised by what has happened. And this is a risk that even the largest and richest organization cannot afford and that even the smallest one need not run. To be more than an inactive agent of the talents in one’s keeping, the management has to accept responsibility for making the future happen. It is the willingness to tackle this purposefully that distinguishes the great organization from the merely competent one, and the organization builder from the manager-suite custodian. In short, it is pointless to try to predict the future. But it is possible and productive to identify major occasions which have already happened irreversibly and which can have predictable effects in the coming future. It is possible, in other words, to identify and prepare the organization for the future which has already happened.